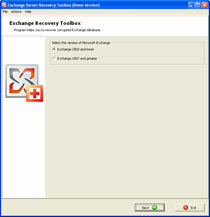 Exchange Server Recovery Toolbox provides an easy and friendly user interface therefore it saves your precious time for additional instructions, explanations and trainings. Get it on your PC and make sure you can now restore EDB files anytime you encounter data corruption problems. For this purpose, the investigation of data corruption issues is not really important and you may initiate this process anytime or skip this stage at all, it does not affect the successful recovery anyway. You can try this suggested Exchange sever recovery tool which is the most reliable and effective solution to recover corrupt Exchange EDB file. It is a wonderful solution that eases the recovery of Exchange and let you to read Exchange database within a second. Advance EDB file to PST converter program smartly export Exchange EDB to PST and make data usable again.